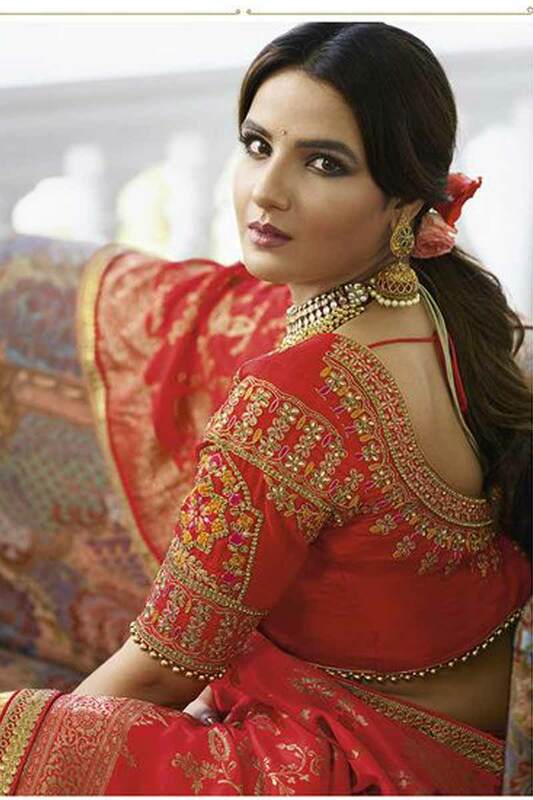 Red jacquard and silk semi stitch Lehenga with Silk Choli. This Lehenga Choli is embellished with resham, zari, zircon, aari, beads, hand, sequins, thread, dori and embroidered .Product are available in 32, 34, 36, 38, 40, 42, 44, 46, 48, 50, 52, 54, 56, 58 sizes. It is perfect for Bridal Wear, Wedding Wear, Karva Chauth, Sangeet, Bridesmaid Wear, Guest of Wedding Wear, Mother of the Bride.This dress is unstitched Lehenga and Choli fabric. This can be stitched using the custom tailoring options below, select “WITH STITCHING” option. To buy unstitched fabric, select the “WITHOUT STITCHING” option. Designs, patterns and colours may slightly vary from the actual colour vs. image due to screen resolution or photography lights. 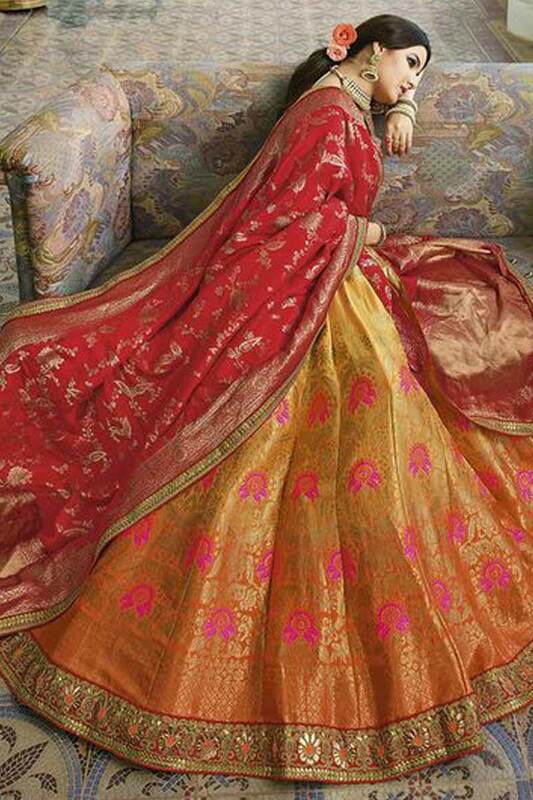 Red jacquard and silk semi stitch Lehenga with Silk Choli. This Lehenga Choli is embellished with resham, zari, zircon, aari, beads, hand, sequins, thread, dori and embroidered. Product are available in 32, 34, 36, 38, 40, 42, 44, 46, 48, 50, 52, 54, 56, 58 sizes. 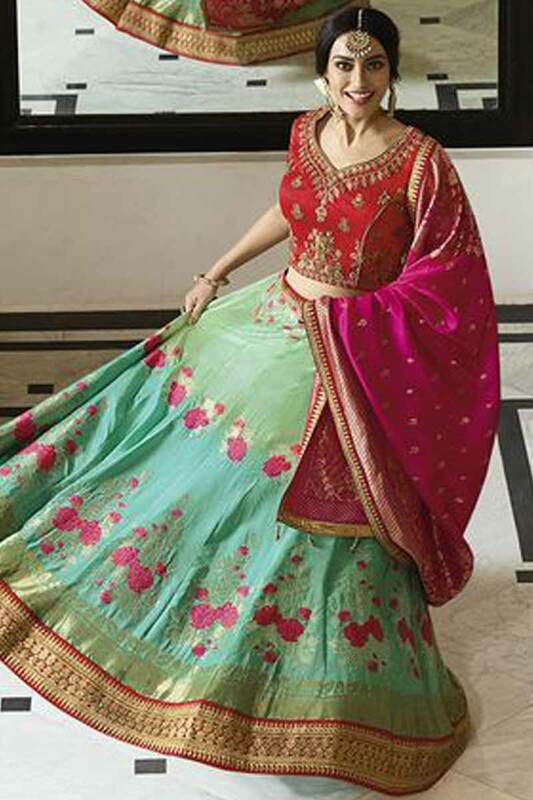 It is perfect for Bridal Wear,Wedding Wear,Karva Chauth,Sangeet,Bridesmaid Wear,Guest of Wedding Wear,Mother of the Bride.This dress is unstitched Lehenga and Choli fabric. This can be stitched using the custom tailoring options below, select “WITH STITCHING” option. To buy unstitched fabric, select the “WITHOUT STITCHING” option. Designs, patterns and colours may slightly vary from the actual colour vs. image due to screen resolution or photography lights. 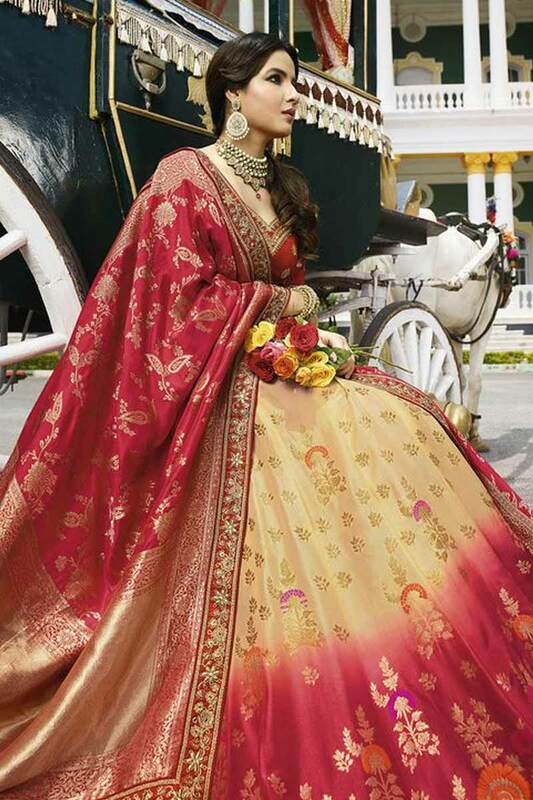 Red jacquard and silk semi stitch Lehenga with Silk Choli. This Lehenga Choli is embellished with resham, zari, zircon, aari, beads, hand, sequins, thread, dori and embroidered .Product are available in 32,34,36,38,40,42,44,46,48,50,52,54,56,58 sizes. 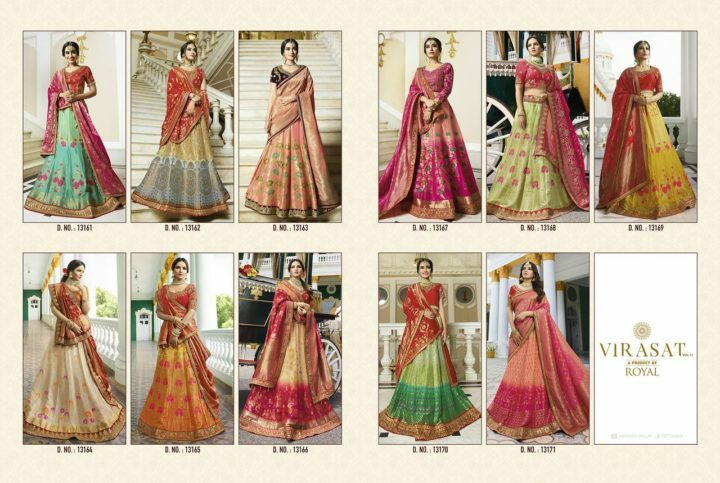 It is perfect for Bridal Wear,Wedding Wear,Karva Chauth,Sangeet,Bridesmaid Wear,Guest of Wedding Wear,Mother of the Bride. This dress is unstitched Lehenga and Choli fabric. This can be stitched using the custom tailoring options below, select “WITH STITCHING” option. To buy unstitched fabric, select the “WITHOUT STITCHING” option. Designs, patterns and colours may slightly vary from the actual colour vs. image due to screen resolution or photography lights. Orange jacquard and silk semi stitch Lehenga with silk Choli. This Lehenga Choli is embellished with resham, zari, zircon, aari, beads, hand, sequins, thread, dori and embroidered .Product are available in 32,34,36,38,40,42,44,46,48,50,52,54,56,58 sizes. It is perfect for Bridal Wear,Wedding Wear,Karva Chauth,Sangeet,Bridesmaid Wear,Guest of Wedding Wear,Mother of the Bride. This dress is unstitched Lehenga and Choli fabric. This can be stitched using the custom tailoring options below, select “WITH STITCHING” option. To buy unstitched fabric, select the “WITHOUT STITCHING” option. Designs, patterns and colours may slightly vary from the actual colour vs. image due to screen resolution or photography lights. 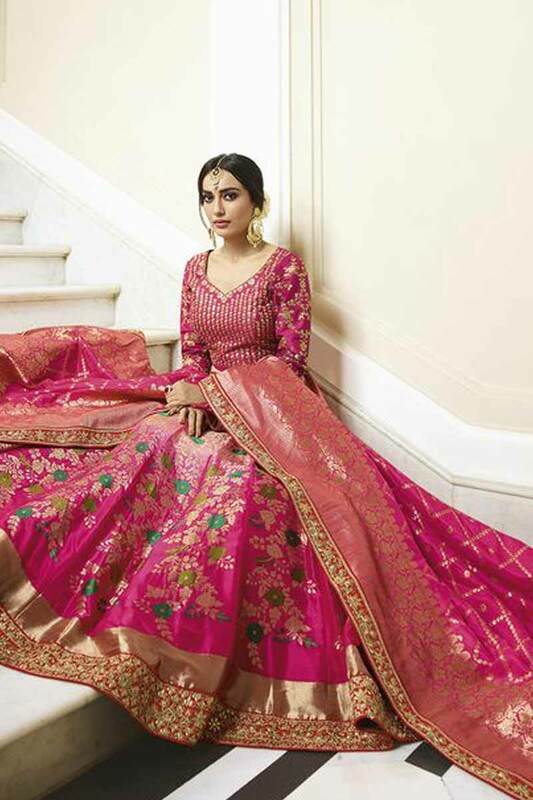 Pink jacquard and silk semi stitch Lehenga with silk Choli. This Lehenga Choli is embellished with resham, zari, zircon, aari, beads, hand, sequins, thread, dori and embroidered .Product are available in 32,34,36,38,40,42,44,46,48,50,52,54,56,58 sizes. It is perfect for Bridal Wear,Wedding Wear,Karva Chauth,Sangeet,Bridesmaid Wear,Guest of Wedding Wear,Mother of the Bride. This dress is unstitched Lehenga and Choli fabric. This can be stitched using the custom tailoring options below, select “WITH STITCHING” option. To buy unstitched fabric, select the “WITHOUT STITCHING” option Designs, patterns and colours may slightly vary from the actual colour vs. image due to screen resolution or photography lights.